Dennis L. Wilcox, Ph.D., is professor emeritus of public relations and past director of the School of Journalism and Mass Communications at San Jose State University, California. He is a Fellow and accredited (APR) member of the Public Relations Society of America (PRSA), former chair of the PRSA Educator’s Academy, and past chair of the public ­relations division of Association for Education in Journalism and Mass Communication (AEJMC). Dr. Wilcox has written six books, including being the lead author of Public Relations Strategies and Tactics and Public Relations Writing and Media Techniques. His honors include PRSA’s “Outstanding Educator,” the Xifra-Award from the University of Girona (Spain), and an honorary doctorate from the University of Bucharest. He is active in the International Public Relations Association (IPRA) and a member of the Arthur W. Page Society, a group of senior communication executives. Dr. Wilcox regularly consults and gives lectures and workshops to students and professionals in a variety of nations. Glen T. Cameron, Ph.D., is Gregory Chair in Journalism ­Research and founder of the Health Communication ­Research Center at the University of Missouri. Dr. Cameron has authored more than 300 articles, chapters, award-­winning conference ­papers, and books on public relations topics. A popular lecturer internationally, Dr. Cameron has received the Baskett-Mosse and Pathfinder awards for ­career achievement. The University of ­Missouri honored him in 2006 with the 21st Century Corps of Discovery Lectureship, which is given once each year by a globally recognized campus scholar. Dr. Cameron’s ongoing public ­relations ­experience includes his management of more than $42 million in external funding of health public relations projects from sources such as the ­National Institutes of Health, the National Cancer Institute, Missouri Foundation for Health, the U.S. ­Department of Agriculture, the Centers for Disease Control and Prevention, the U.S Department of Defense, and Monsanto. Whenever he can, Dr. Cameron enjoys the rivers and mountains of his native Montana as well as wild spots around the world. Bryan H. Reber, Ph.D., is associate professor of public ­relations at the University of Georgia, Grady College of Journalism and Mass Communication. Dr. Reber teaches courses that offer an introduction to public relations, management, writing, and campaigns. On the graduate level, he teaches classes in topics including management, persuasion, campaign research, and public opinion. His research focuses on public relations theory, practice, pedagogy, and health communication and has been published in the Journal of Public Relations Research, Journalism and Mass Communication Quarterly, Journal of Health Communication, Public Relations Review, and Journal of Broadcasting and Electronic Media. Dr. Reber regularly presents his research at national and international academic conferences. He is the co-author of two books: Gaining Influence in Public Relations and Public Relations ­Today: Managing Competition and Conflict. Dr. Reber worked for 15 years in public relations at Bethel College, Kansas. He has conducted research for the Sierra Club, Ketchum, and the Georgia Hospital Association, among ­others. Jae-Hwa Shin, Ph.D., Mph., is associate professor in the School of Mass Communication and Journalism at the University of Southern Mississippi. Dr. Shin is widely recognized as a prolific researcher in the field of public relations and has ­actively participated in the emerging development of public relations theory. She co-authored Public Relations ­Today: Managing Conflict and Competition, a text that incorporates her research, teaching, and professional experience. In addition, she has published her research in peer-reviewed journals such as Public ­Relations Review, Journalism & Mass Communication Quarterly, Science Communication Journal, and Journal of Communication in Health Care. Dr. Shin is an active presenter at national and ­international conferences such as those sponsored by the ­International Communication Association, National Communication Association, and Association for Education in Journalism and Mass Communication. Prior to her teaching at the University of Southern Mississippi, she worked as the Public Relations Director for the Korea Economic Research Institute of the Federation of Korean Industries. 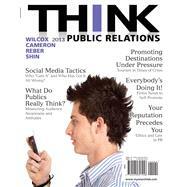 Chapter 1: What is Public Relations? Social Media in Action: Facebook Friends = Brain Power? Social Media in Action: A Comfortable Discussion or Too Much Information? Social Media in Action: Are You A Mayor? What Is Global Public Relations? Social Media in Action: LinkedIn as a Public Relations Tactic?